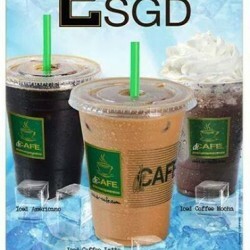 Beat the heat with this 1-for-1 chilled drinks promo at dr. CAFÉ COFFEE exclusively for Students & NSFs! Chill out with your buddies with this icy-cool deal exclusively for all Students and NSFs! 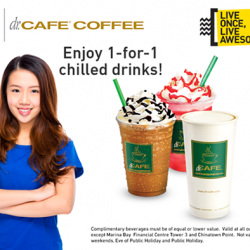 Enjoy 1-for-1 chilled drinks at dr. CAFE COFFEE from now till 31 Dec 2014. Simply show your FB Like on the page dr. CAFE COFFEE and enjoy Iced Coffee Latte, Ice Coffee Mocha and Iced Americano at $2.Upsize and enjoy great savings just $3 for Grande and $4 for Jumbo! Don't miss Dr Café Coffee's Happy Hours offer, ongoing Daily till 31st August, 2014! 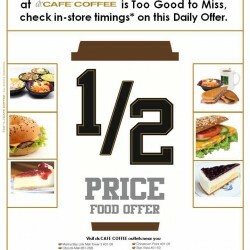 All Cakes, Sandwiches & Salad at Half Off, check in-store timings*. Available at all outlets except 112 Katong. *from 5pm onwards : Singapore Cruise Centre @Habour Front & Marina Bay Financial Tower 3. *from 7pm onwards : CityLink Mall, Plaza Singapura, Thomson Plaza & Zhongshan Park. *from 8pm onwards : The Star Vista & Chinatown Point.